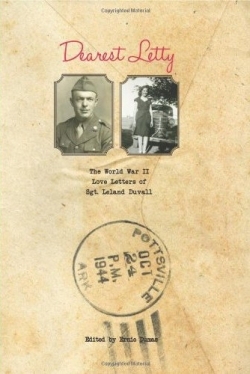 Dearest Letty is a collection of love letters written by Leland Duvall to his sweetheart, Letty Jones, during World War II. Duvall, who became a well-known journalist in Arkansas after the war, was a now-and-again farm worker near Moreland with a grade-school education when he received his World War II draft notice in 1942. He trained in California, where he began to write to Letty Jones, a Pottsville girl he’d had a crush on for several years. Throughout the war, Leland wrote Letty a torrent of letters, falling in love with her – and with writing. The letters, discovered after his death, were organized and edited by Duvall’s longtime friend and colleague, Ernie Dumas, who provides facts about where Duvall was and the perils he endured, information that was often missing due to wartime censors and Duvall’s concerns over worrying or boring Letty.